In my previous post on this subject I looked at the early drawing forms all children use: scribbles and circular lines. 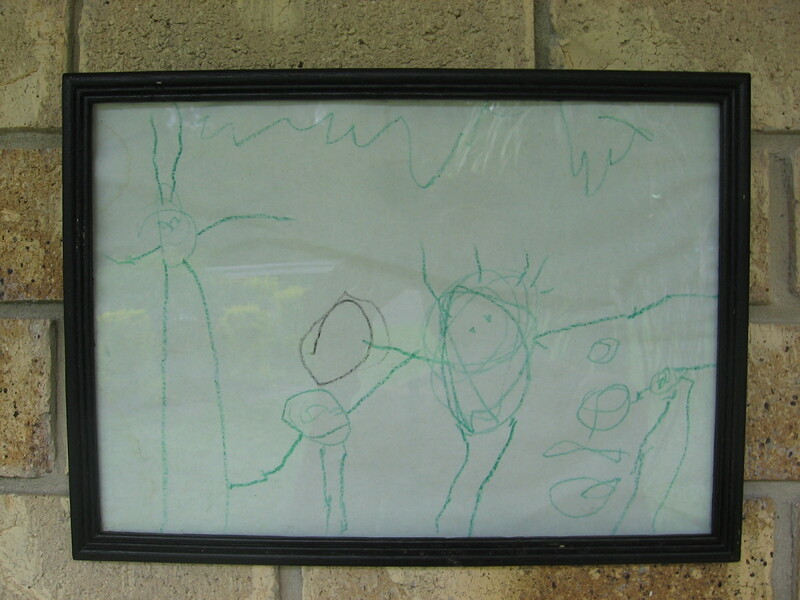 This type of drawing is most prevalent between the ages of 2 and 3.5 years of age, and for a long time that was all we would see from Kaelan, as far as drawing went. He never was one to spend a great deal of time making pictures, until recently, preferring instead to construct images from blocks and connecting toys. Just about all the drawing samples I collected from Kaelan were his only early drawings! I was so proud of it I framed it and hung it by our front door for the whole world to see who lived in this house! On the right he has drawn Daddy, then himself holding hands with me. Next to the tower of circles, with the very long legs, is Rosella. There is even a sky above us. This picture totally blew me away, but we didn’t see anything like it for a long time afterwards. Having a new person enter our family certainly made an impression on him, and this drawing also appeared just as Kaelan was passing out of a particularly trying (in my opinion!) period of his development, and into a much more peaceful and independent phase of his three-year-oldness. We also began to see straight lines occuring, and crosses. Now, with Kaelan at 4 years of age, (this happens earlier for some children, around 3 years of age) we started seeing some new themes emerge. At first these crosses would appear on people (like bodies), or isolated, and then he would begin to join them up and began to draw dwelling-like shapes, such as these ones. They have a defined outer boundary and sectioned-off inner boundaries, like rooms. Sometimes he told me they were buildings, but in the next breath he would say they were something else entirely. So, clearly Kaelan was still not intentionally representing his experiences of life in his drawings, instead I feel his drawings were reflecting what was occuring for him internally. I was more interested not in what they represented visually, but what they might be an expression of: his inner development (back to the INCARNATING interpretation again). With the idea of Incarnation in mind (coming into one’s own consciousness), the straight lines and crosses are symbolic of the child’s increasing consciousness of themselves as key players in their world. They are coming in to a sense of their own ‘uprightness’. 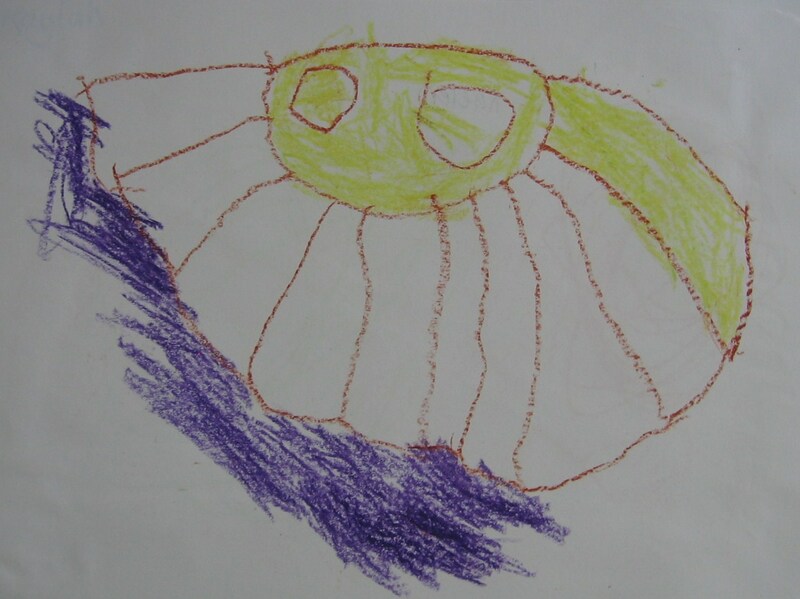 In a sense, children who are drawing these themes are now aware that they are an individual in the world, no longer so connected to the ‘cosmos’ of infancy. These children are learning speech and making choices and becoming independent. They are learning about boundaries, and at this age we begin to see pictures with a blue line for sky and a green line for the grass, representing the boundaries of their world. You will see these themes emerge any time from about 3 years of age onwards. Next the straight lines begin to converge into the centre of the page and we begin to see many ‘star’ and ‘sun’ shapes with straight lines leading into the centre of an object. This marks a great leap in development, the time when a child is very conscious of their own place in the world: they are beginning to ‘wake up’ and are showing the beginning of an awareness of their own thoughts and feelings. When I was teaching in kindy I would be amazed on some days that almost every child in the class would draw the same pictures. They would all begin to divide their pages into sections resembling a star. 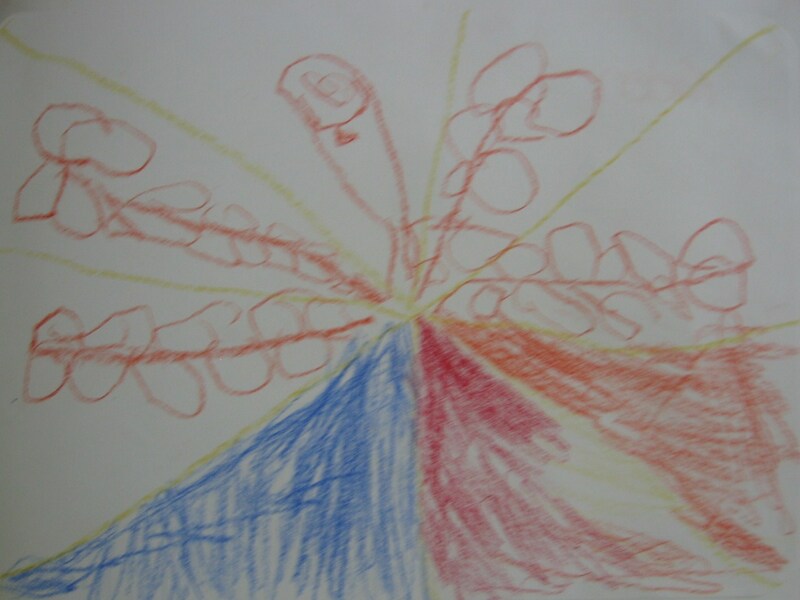 It took me a while to realise that while some children were imitating the theme from others, but they were all drawing stars and suns as a reflection of their own inner experiences. Those that were more ‘centred’ in themselves (confident in their own abilities and aware of the power of their words and actions, well-developed language and listening skills, receptive to adult conversation and instruction) would have the straightest lines, the most conscise points of meeting in the middle, while the ones who were still drawing from imitation were either not ready yet, still in dreamy realm of the cosmos, or just beginning to enter this phase of awakening. Their star drawings were hesitant, and the lines not crossing in the centre, but still mostly straight up and down. It was a fascinating phenomenon. 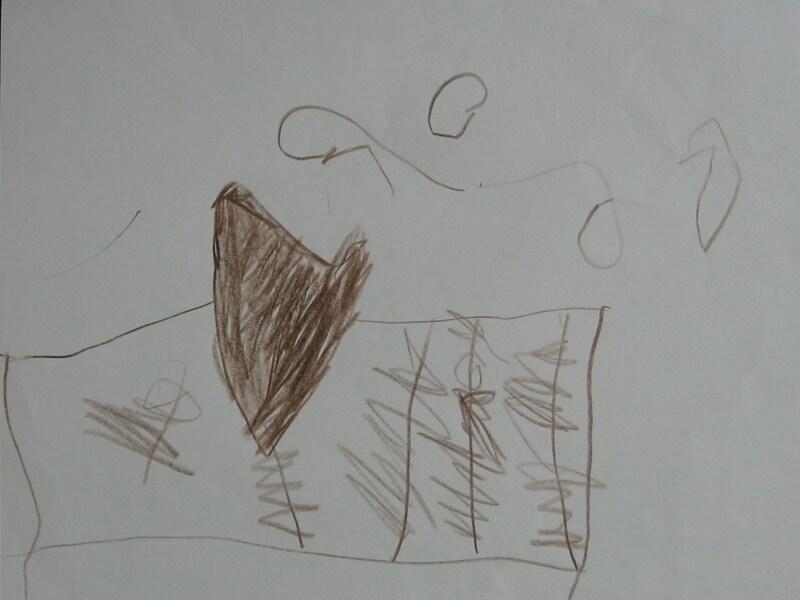 You can imagine my excitement when I began to see these themes emerge in Kaelan’s drawings too. He was coming down from the stars. In the star on the right hand side above, you will also see some branches and leaf shapes as part of the star. I will discuss this as part of my next post when I will talk about the development of the human form. Thanks Jen. Great information. It’s really quite amazing looking at Kaelan’s pictures. They are so similar to what Caleb draws. 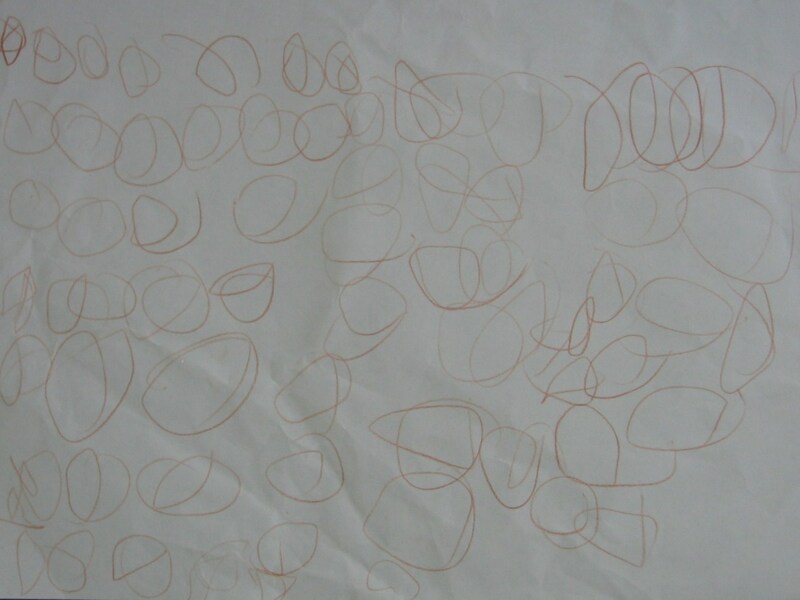 Something I wanted to ask – today Isla and I were drawing spirals together. I noticed that I drew mine counter-clockwise and she drew hers clockwise. Any significance in this do you think? I’m not sure, but clockwise is the direction that the blood flows in the body, and it is why we are always careful to turn our circle dances and circle games clockwise when we work with children, to enhance that flow. So perhaps she is merely reflecting that energy in her body. 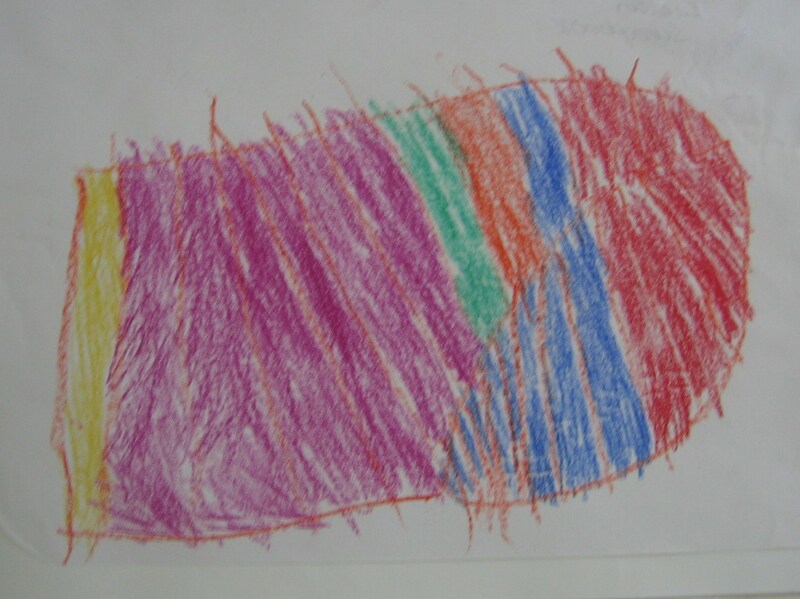 But as I said in the beginning – who really knows what or why children draw? Only they do. We can only come close to knowing but observing. Thanks Jen. I drew one and asked her to copy and she did it at exactly the same pace I did (i varied from fast to slow with each one) but each time she drew them clockwise as opposed to my counter clockwise. I thought it was interesting. another thought I had – and of course it may be totally wrong – is that the clockwise direction of her spirals, mirroring the clockwise flow of blood is a reflection of her BUILDING UP processes in her body. Adults have completed their building up and now it is essential for us to begin BREAKING DOWN so that we do not become overloaded, hence anti-clockwise. Really, you can read anything into it, but that was an interesting thought all the same. Be good to ask Mama Moontime what she thinks about it too.